The Rambo Techni Waffle cooler is made of a polyester waffle outer material. 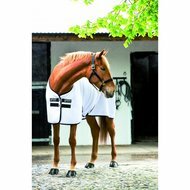 The white color helps this sweat blanket to reflect the sun, making it less warm for the horse. 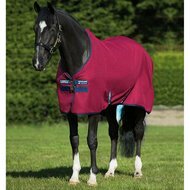 Due to the waffle fabric and the moisture-wicking technology that this blanket contains, your horse will dry extra quickly. 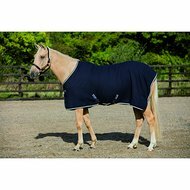 Can be used as a stable, transport or show blanket. The blanket has double hook / eye chest closure, cross surcingles and a leg strap. The blanket not only has a great fit, it also looks really classy. Perfect for the summer! Super nice blanket! Fits well and works as it should work! Very happy with it. I have the Navy Beige so it is not sun-blocking, but I'm not looking for that either. Nice airy blanket but very contagious that white. Have decided to return him. Question: Which size for pony?